The audio of this re-creation is from the collection of voice-over announcer Jerry Immel, who contributed all of the audio on our 1950's TV sign-off page. Mr. Immel had very recently found this clip and quickly sent it to the Webmaster. The SOGP in the video was the version used by the NAB between mid-1955 and early 1958. From mid-1951 to early-1958 the NAB was known as the National Association of Radio and Television Broadcasters (NARTB). This version was the first to utilize the shape of a TV screen with olive branches on the sides. The Seal is original: it was found online by the Webmaster some years ago on a webpage that has since disappeared. Since the clouds in the original had been cropped out in the image that was found, the Webmaster placed the SOGP inside a photo of clouds taken by he some years back.  The WCBS-TV "Big 2" slide is one used by the station in the late 1950s (apologies for the low quality of the image). It is similar to the one featured in the 1964 re-creation sign-off linked below.